When John Carney made ‘Once’ it was widely hailed as a revelation in the musical drama genre, a heartfelt and sincere film that won over many hearts with its loving musical style and refreshing lack of overproduction. 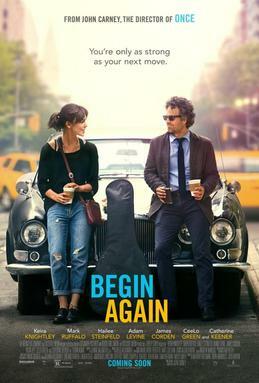 In ‘Begin Again’ Carney attempts to recapture some of that unbridled love for music but brings in a more refined style that works both for and against the film. Like ‘Once’ it is a flight of fancy where one’s belief must be adequately suspended in order to go along for the ride and makes up for its fanciful nature by laying on the charm, but there are moments where it goes too far with its fairy tale elements and starts to tip in to a realm that’s slightly too cringey to be endearing. Thankfully these moments are spaced out enough that we get a well-meaning, feel-good film for the majority, with strong performances from the likes of the always reliable Mark Ruffalo, who shines as the put-upon A&R man, showcasing his usual talent for portraying a grizzled, ruffled character who makes his way out of the dumps slowly but surely. Other good performances come from Keira Knightley as rising star Greta in one of her more expressive performances, showing she’s much more than the often wooden actress we’ve seen in the past, and unbelievably also from Adam Levine, lead singer of Maroon 5 whose turn as Greta’s boyfriend Dave is actually pretty damn good. The fact the performances are so strong also elevates the sporadic hamminess of the script since it’s possible to get lost in the characters, and strong support turns by the likes of the brilliant Catherine Keener and Hailee Steinfeld means this carries across the board. Even a wonderful little cameo by Cee Lo Green works well and he becomes the centre of a couple of humorous scenes which could in other hands have just been self-congratulatory. 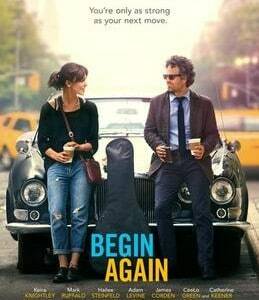 ‘Begin Again’ is a film with its heart in the right place and even though it has a number of flaws it overcomes them by making you believe in the fairy tale if only for a little while. Sure, the songs are markedly overproduced and the outdoor setting for the songs doesn’t ever come across as believable, but it’s a strength of the film that this all feels incidental in the face of the narrative of the story, so expertly pulled along by Ruffalo in particular so as to ensure that the film manages to clamber over the bumps in the road to become an enjoyable if not necessarily extremely memorable film that could have been better but ended up adding up to more than the sum of its parts.